When the best option is to let go of the life you planned for yourself and find a new path, a world of possibilities can surprisingly open up. Learn whether it is time to let go, and if so, how to move through your grief and find your way forward in The Next Happy. If you believe, you can do anything. Although well-meaning, these intended words of inspiration can make us feel like failures. The reality is that no matter how positive our outlook or how tenacious our approach, our dreams simply do not always come true–and there is nothing we can do about it. 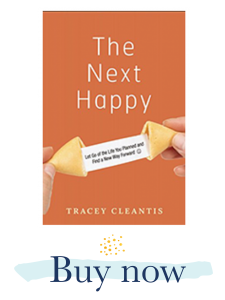 After multiple fertility treatments and years of hardship in her pursuit to have a child, Tracey Cleantis was forced to face this reality head-on. Yet, through this process and her work counseling hundreds of clients through the loss of their goals and aspirations, she discovered one simple truth: Sometimes there comes a time when the smartest, healthiest, and sanest thing to do is to let go of the original plan in order to find a new way forward toward happiness. And with this critical shift, a world of possibilities opens up to us. New, tangible dreams take shape. In The Next Happy, Cleantis offers a roadmap for that journey, teaching you how to face the possibility of letting go of a dream that isn’t working accept and face sadness, anger, and shame understand the true reasons why you wanted what you wanted and the real-life causes for why you didn’t get it to ask the questions that will let you move on and set realistic goals for finding a new way forward. With down-to-earth wisdom and humor, this enlightening counterpoint to the popular self-help notion to “follow your dream, no matter what it takes” provides the guidance and support to help you make the decision of whether it is time to give up an impossible dream, and if so, move through your grief, and discover the next happy. …a must-read for anyone who’s had enough of platitudes and is ready for a self-help manual with a dose of reality. A bold, brave and incredibly relevant book.